Bio-Logic Aqua | Bio Logic Aqua Research® Technologies International, Inc.
Water Research is our Mission, Vision and Only Business. The World’s First Patented, All-Natural Eye Mist Product for Dry Eyes. “Only three-percent of the world’s water is fresh and two-thirds of that is ice. Much of the remainder is either drying up or becoming polluted, making fresh water an endangered species. Water, the source of all life on Earth, is unique – and easily polluted – because it combines with nearly every substance with which it comes in contact, good or bad” (adapted from National Geographic, Special Edition, 1993). A vault of new discoveries. Research, under the guidance of Sharon F. Kleyne, Director and Founder, has concentrated on the benefits of Bio-Logic Aqua for relief of dry skin and dry, irritated eyes. This is yielding a vault of new theories and discoveries about skin and eye dehydration. Breakthrough products have resulted including Nature’s Tears EyeMist, Nature’s Mist – Face of the Water, and Bio Med Wash, an all-natural first-aid wash. These products are revolutionizing the treatment of dry skin and dry, irritated eyes while generating excitement among skin, eye care and emergency professionals. Research is continuing into the application of Bio-Logic Aqua for dry mouth, cosmetic enhancement, tissue cell research, surgical healing, and numerous additional benefits. Bio-Logic Aqua Technologies’ two highest priorities are public education and community involvement. Although success is certainly a major objective, education about skin and eye moisturizing, and the harmful dehydration effects of the environment, dry air both inside and out, has become a higher calling. Forced air heating and cooling, building insulation, airline travel, air pollution, increased stress, increased population, ozone depletion and many other factors are decreasing the available moisture in the air and placing life on Earth at increasing risk. Public awareness of this serious problem is critical, and humanity as a whole must be taught ways in which individuals can protect themselves and minimize their own health damage. Sharon Kleyne has long recognized a connection between environmental dehydration and a dramatic increase in a potentially fatal cancer called “childhood melanoma.” Bio-Logic Aqua Technologies’ Save-a-Child’s Life was founded in 1996 (became a foundation in 2003) in response to this urgent need. Through its annual Rogue Riviera Water Festival and various other events, the Foundation raises money for childhood melanoma research as well as other children’s charities. The Foundation and Festival have continued to grow annually, while gaining a national reputation as the first foundation to encourage all of us to put our heart and our hands, recognize melanoma in time to save children’s lives. (Grants Pass, OR, March 9, 2011)- Sharon Kleyne, internationally syndicated radio talk show host, educator and entrepreneur, will demonstrate Nature’s Tears® EyeMist®, her recently patented, all-organic water mist innovation for the eyes. Sharon Kleyne, internationally syndicated radio talk show host and Bio-Logic Aqua Research Founder, will appear at Natural Products Expo West 2011. She will answer questions about dry eye and dry air, and demonstrate her newly patented all-natural organic eye mist product, Nature’s Tears® EyeMist®. Sharon Kleyne’s appearance at Natural Products Expo West 2011 is sponsored by Health Enterprises, Inc., booth #5610. She will appear from 11 a.m. to 2 p.m. on Saturday, March 12, 2011. Natural Products Expo 2011, Anaheim Convention Center, Anaheim, CA, March 8-13, 2011. All-natural water is the basis for natural health and life on Earth. The eyes’ all-important tear film is comprised of 99% all-natural water. In 2009, Sharon Kleyne was awarded a United States patent on the technology of applying all-natural and organic, 100% safe water as a fine-mist to penetrate, hydrate and moisturize the natural tear film to soothe dry eyes. Sharon Kleyne’s all-water, all-natural water discoveries have been endorsed by universities, doctors and scientists worldwide for their innovative approach to natural eye hydration. 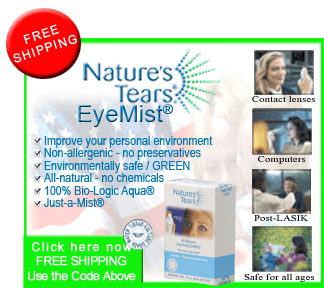 Nature’s Tears EyeMist contains only 100% all-natural Bio-Logic Aqua tissue culture grade water. They contain no eye drops, saline solution, chemicals, additives, preservatives or potential allergens. The products are 100% safe and healthy. Contact Sharon Kleyne at 1-800-FOR-MIST, Sharon@biologicaquaresearch.com and www.biologicaqua.com. Listen to The Sharon Kleyne Hour – Power of Water, on the Internet at www.WorldTalkRadio.com or at www.SharonKleyneHour.com. While attending Natural Products Expo West 2011, stop by and talk to Sharon Kleyne, witness a demonstration of this amazing new product, and obtain free product samples and coupons. “It has been unexpectedly discovered that administering an amount of fluid (water) to the surface of the eye at a level below that which results in flooding and washing away of the tear film, results in an improvement in eye moisture (water) over prior methods” US patent #7524511-1B, April 9, 2009. Bio-Logic Aqua Research Technologies International announces a new United States patent on a method of delivering water directly to the eyes, in the form of an ultra-fine mist, to increase tear film hydration and moisture content for dry eye relief. The eye mist has been found to reestablish the normal water state in individuals with dry eye. (Grants Pass, OR, February 9, 2011) – On April 9, 2009, a United States patent was awarded to Sharon Kleyne, Founder and Research Director at Bio-Logic Aqua Research Technologies International, the company has announced. The patent is on a method of administering “aqueous fluid” (water) directly to the eyes’ tear film to increase moisture content and hydration for dry eye relief. The eyes’ natural tear film, covering and protecting the eye’s surface, is a complex, three layered structure containing lipids, water, electrolyte, proteins and antibodies. Because conventional eye drop applications exceed the natural tear film volume, drops have the disadvantage of flooding the eye, which washes away the existing tear film and replaces it with the fluid that comprises the drops. The newly patented water mist application delivers water hydration to the eyes as an ultra-fine eye mist, allowing the tear film to naturally absorb water directly from the air. The eye mist has been found to reestablish the normal water state in individuals with dry eye. Tear film researchers at Bio-Logic Aqua have discovered a growing link between air pollution, drought and dry air, out of control allergies and the global crisis in dry eye and other dehydration diseases. The worldwide dry air and water crisis has created a rapidly growing demand for a hand held eye mist product that empowers each individual to become proactive in seeking education to protect their own health.